Similar to a Facebook layout, MeetMe.com gathers people from your local area to meet each other online. Users can make friends, post on their walls, or find a single people to date. Your location sets you up with the people in the local area, so it’s easy to find a person who lives close by. MeetMe’s mobile device is available for Apple and Android. However, there is talk of developing the app for the Blackberry market as well. The current application allows users to ask other members questions, receive notifications, make comments, and manage users in their lists. The mobile site is set up like a large Facebook wall. Messages and posts are updated every few minutes, and users have the opportunity to message other members privately. Membership and registration is free for MeetMe.com. However, for your profile to gain more exposure and get more views, MeetMe offers users the ability to purchase credits. Premium credit purchases begin at $9.99 for 625 credits. You can also choose whether to rebill your payment option, or refill it manually when you go below 50 credits. 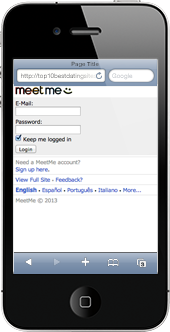 MeetMe’s mobile site is easy to use and creates an engaging atmosphere. Meeting more than 40 million users online gives you the chance to make new friends or find a local date. At the bottom of every page on MeetMe’s site, a message stresses the importance of reporting abusive content. They also caution individuals to be aware that some people may or may not be the person they claim to be. Following this advice is a link to a safety online website that teaches users tips for safe online dating.